Liberia’s 2014 Ebola outbreak yielded success in a trial of 2 candidate vaccines that pose no major safety concerns and elicit immune responses by 1 month after initial vaccination that last for at least 1 year. The study was first conducted by the Partnership for Research on Ebola Virus in Liberia, or PREVAIL. It operates under the umbrella of a joint Liberia-US clinical research partnership established in 2014 to assist Liberia in the development of vaccines for Ebola. "While the clinical significance of these observations remains to be precisely determined, these data coupled with the existing human and animal data, provide optimism that having an effective Ebola vaccine is an achievable goal," H. Clifford Lane, M.D, study author, Clinical Director, NIAID, told MD Magazine. The findings from PREVAIL-1 are based on a large, randomized, placebo-controlled clinical trial of 1,500 Liberians. The 3-arm trial enrolled men and women 18 years and older with no reported history of Ebola virus disease. Three groups of 500 volunteers received 1 of the vaccine candidates, the chimpanzee adenovirus 3-based vaccine (ChAd3-EBOZ) or the recombinant vesicular stomatitis virus-based vaccine (rVSV-ZEBOV), or a placebo saline injection. Participants provided blood samples before vaccination and again at 1 week, 1 month, 6 months and 1 year post vaccination. Each of the blood samples were then tested for antibodies to the Ebola virus. Responses at 1 week were modest with both vaccines, however, by 1 month, 71% of ChAd3-EBOZ recipients and 84% of rVSV-ZEBOV recipients developed an antibody response compared to 3% of participants who received the placebo. At 1 year antibody responses were largely maintained in both groups, 64% of ChAd3-EBOZ recipients and 80% of rVSV-ZEBOV recipients had an antibody response versus 7% of placebo recipients. Primary outcome measures included serious adverse effects in the first 30 days of vaccination, and immunogenicity measures at 1 month for participants without elevated levels at baseline. Mild to moderate side effects were resolved like headache, muscle pain, feverishness and fatigue for those recipients of the vaccines. Overall, investigators did not identify any major safety concerns, and most of the serious medical issues reported were due to malaria. ChAd3-EBOZ vaccine, co-developed by the US National Institute of Allergy and Infectious Diseases (NIAD) and GlaxoSmithKline, is comprised of a cAd3 vector with a DNA fragment insert that encodes the Ebola virus glycoprotein. The rVSV-ZEBOV vaccine, initially engineered by the Public Health Agency of Canada, is now licensed to Merck Sharp and Dohme Corp, a subsidiary of Merck, is comprised of a single recombinant vesicular stomatitis virus (VSV) isolate genetically engineered to replace the gene encoding the G envelope glycoprotein to neutralize the gene encoding the envelope glycoprotein from the Ebola virus Zaire strain, ZEBOV. The trial included an embedded phase 2 subtrial evaluating safety and immunogenicity. The phase 3 was not completed because of a declining number of Ebola cases and ultimately the end of the epidemic. Within 1 month after the injection, 20 participants had serious adverse effects including 6 participants, 1.2%, in the ChAd3-EBOZ group, 6, 1.2%, in the rVSV-ZEBOV group, and 8, 1.6% in the placebo group. A total of 70% of serious adverse effects in the first 30 days were attributed to malaria. By 12 months, 1 death occurred among participants in the ChAd3-EBOZ group, 5 among the rVSV-ZEBOV group and 6 among those in the placebo group, but none of the deaths were attributed to Ebola. 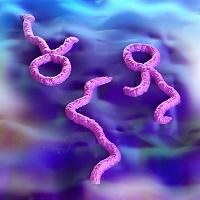 At the beginning of the trial, investigators found 4% of participants had a certain threshold of Ebola antibodies, indicative of past Ebola infection, but no known history of the virus. Investigators also found the proportion of participants developing malaria by 1 year was lower for those who received the investigational vaccines versus those that received the placebo, particularly among the rVSV-ZEBOV recipients. The study, “Phase 2 Placebo-Controlled Trial of Two Vaccines to Prevent Ebola in Liberia” was published in The New England Journal of Medicine.